MORE KIDS THAN SUITCASES: What Would You Do? There's a famous saying that Christians are supposed to keep in mind when faced with decisions. 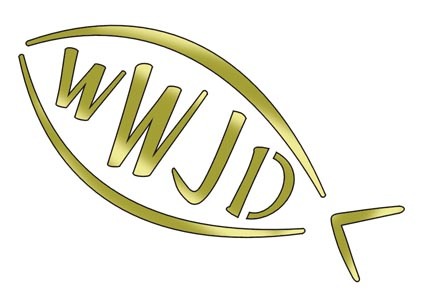 It's called "What Would Jesus Do", or WWJD for short (because Jesus was all about keeping it brief). What is means is that when you are confronted with a decision that you need to make, you should consider what choice Jesus would have made in the same scenario, and then follow that path. It's good advice when it comes to important questions like "Should I steal this car?" (umm...hypothetical situations here) or "Should I hit my sister?" (Again...hypothetical, but in my defense Jesus never had to deal with my sister). There's occasions though, where it's very hard to discern what decision Jesus would have made. The Bible tells me how to handle it if I have seven years of bad crops, but it doesn't specifically address what to do if the free continental breakfast runs out of Cinnamon Toast Crunch (although I'm pretty sure Jesus would have been ticked). In situations like that, I find myself using a slightly different acronym to help with my decision making - WWMRD or "What Would My Readers Do?" Yes little did you know it, but I think of you guys when I'm traveling. Not all the time - that would be creepy - but whenever I need to choose between two courses of action, I try and figure out which path you would take. Unfortunately, I have no idea what you guys would do. It seems we don't know each other anywhere near as well as I thought we did, so in an effort to rectify that situation, I'm going to give you a few scenarios that I ran into on our latest trip where I had to decide what to do. I'd love it if you folks would give me an idea of what you would have done, thus helping me to have a better basis for decision making next time, although I promise you that #4 is never going to come up again. We arrived at a rather deserted Hyatt Regency Bonaventure late in the evening and proceeded to check-in. We had used a guaranteed upgrade certificate to move up to a 1BR suite on our original reservation, but when we checked in we were told that the hotel had taken the liberty of upgrading our room to a suite as a reward for being a Diamond member. When we got to our room, we discovered that the door to the adjoining room had been left open, and that we were in a 2BR suite. While the extra room would have been a huge bonus, my concern was that we were never given keys to the second room, so if we used the room but the hotel decided to give it to somebody else, we could have found ourselves in an awkward situation. Should we use the second bedroom or not? What would you do? I don't know if anybody else does, but I actually like to look through the hotel features binder that every room seems to have. I'm not sure what it is I'm looking for, as they almost always look the same, but I still like to check and see if there's anything special that I didn't know about in the hotel. Shortly after arrival at the Radisson I opened their hotel features book and found a needle stuck inside the rings of the binder. It looked like an unused insulin needle (although I'm not well versed in the world of needles, so this is a guess), and it did have a protective cap on it to prevent anyone from accidentally stabbing themselves, but it still made me a little uneasy to think that my kids could have found it first. Granted, that seems like quite a long shot since it would involve my kids opening a book during their summer vacation, but it still could have happened. Too many different paths to list, so I'll just ask: What would you do? As usual, we were running a little late when it was time to return our car in Miami. On top of that, we'd managed to find ourselves hitting rush hour, and basically limited to a very slow crawl while trying to make our way back to the car rental depot. Just as we were starting to move a little, I saw a sign for the turnoff to the Sun Life Stadium - home of the Miami Dolphins. I'm a lifelong Miami Dolphin fan, so before anybody could object I've darted off down the exit and headed towards the stadium. Lori points out that we won't get the car back on time if we stop, but that she can take a few pictures from the road as we go by if I want. I really want to get out and see the stadium, but the late fee on the van is $70 a day, and we only paid $300 for the entire week. What would you do? We took lots of pictures on the beach in Florida, but I only found myself faced with a decision about one. Standing on the balcony of our room, I was taking some pictures of things that I thought looked like typical beach shots...birds diving for fish....dogs running in waves...that kind of thing. As I was wrapping up, I saw something that just screamed "Beach life" to me, and I had to grab one last shot. Of course, just as I take this final picture, my wife comes out on the balcony and asks me what I'm taking pictures of. I ask you dear readers: What would you do?